Modern Mormon Men: What is Appropriate Religious Decor for Our Homes? I do have religious art in my home: A bust of Christ carved by a Jewish man in Israel. It reminds me of my travels there, and feels more like Christ than some of the popular LDS images that cause me to envision a California surfer. I have an architecture blueprint replica of the Kirtland temple—a reminder of my mission in Ohio and the sacrifice of the early saints. It was purchased at the Community of Christ Book Store. I also have photos of my recent wedding day, in front of the temple. 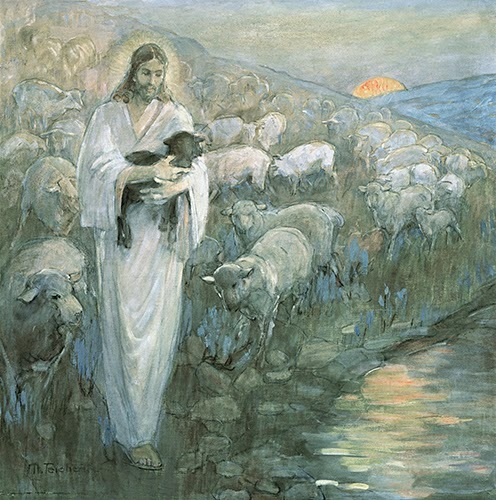 I have never felt ashamed before in the lack of LDS art I display… until recently. I wonder if some believe that the art sold at Deseret Book is doctrinal, and that to be a Mormon—a “good” Mormon—it is mandatory I get myself some framed prints. Discovering Elder Stevenson’s talk didn’t help, because I wonder if this is the art he is asking us about. As I go through my home with my spiritual eyes and I ask myself about cleanliness, Godly reminders, and contemplate if my home feels like a sanctuary, should I feel ashamed that little “Mormon Art” adorns my walls? Art and design communicate with my soul. If I have the responsibility of creating a spiritual haven for my family, and I feel the best way to do this is with art that I find strong and beautiful, should I not remain true to my creative intuition? If I think art from all over the world, portraying different traditions, cultures, and even religion, is a way to bring harmony and understanding into my home, is this not what I should give my family? I wrote those questions in a way that tells me: Yes Lauren, that is what you should do! But I also left them as questions, rather than statements, so that I could remain open, and ask the readers here: What do you think? What is your opinion on appropriate religious décor? What does Elder Stevenson mean when he asks us about "appropriate pictures of the temple and Savior"? Lauren Johnson first wrote for the Modern Mormon Men team about being a 32-year-old single. It's sort of a blur, but somehow she found herself engaged later that year, and married at 33. She considers herself a story-teller, and was a television reporter in both Idaho and Salt Lake City, most recently with ABC 4. Some might recognize her as the founder and original host of "The Cultural Hall" podcast. She's now living in Boston, and experiencing what is being a newlywed. She loves the Mormon tradition of calling each other Brother and Sister. Since serving her mission in Cleveland, she prefers Brotha' and Sistah. Sistah Johnson's 2014 New Years Resolutions are to become a better tweeter, and to continue wearing something from a thrift store every single day—something she semi-regrets committing to during the summer of 2013. Twitter: @laurenruthie. Blog: laurenruthie.blogspot.com.